If you want someone to review a doll, there’s no point asking a parent. Kids are the experts, which is why we asked little miss Ivie instead. 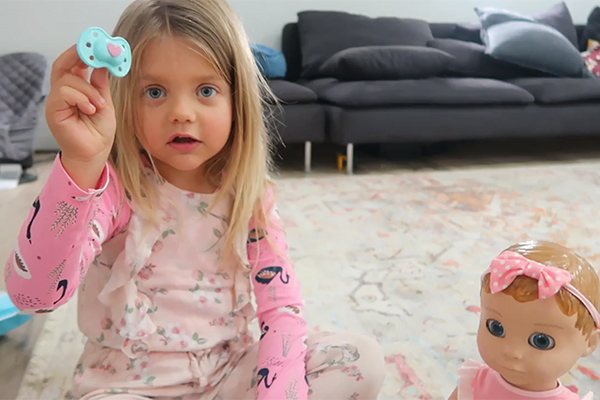 She’s the eldest daughter of mother of four and super-blogger Mel Watts and at just five years of age, is already quite the doll connoisseur. Luvabella is also smart and packed with personality. Amazingly, the more you play with her, the more she learns and interacts. The doll boasts over 100 words and phrases in its vocabulary, which are gradually ‘unlocked’ through play as time goes by. Her kids also love how life-like Luvabella is, even if it’s caused Mel some confusion while caring for her own new baby Sonny. With the added bonus that this child “shuts off and goes to sleep easily”, she jokes.